Great Stories About Having A Great Time! One of the most important jobs of Party Machine Celebrations is to create the proper mood, tone and ambiance for a celebration. And the best way to do that is with a great first impression as guests enter the room. Through creative use of lighting, decoration and music, any banquet space can be magically transformed. 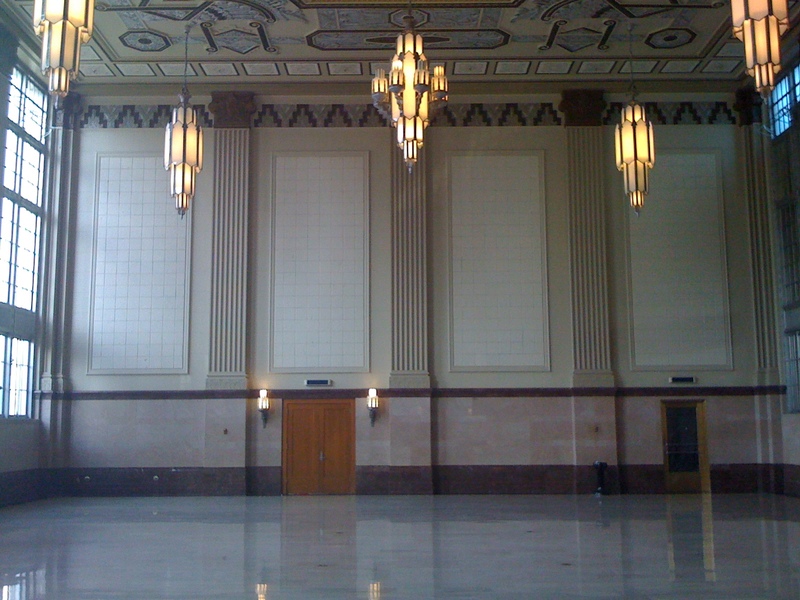 One of my favorite venues is the historic Texas & Pacific Station in downtown Fort Worth. 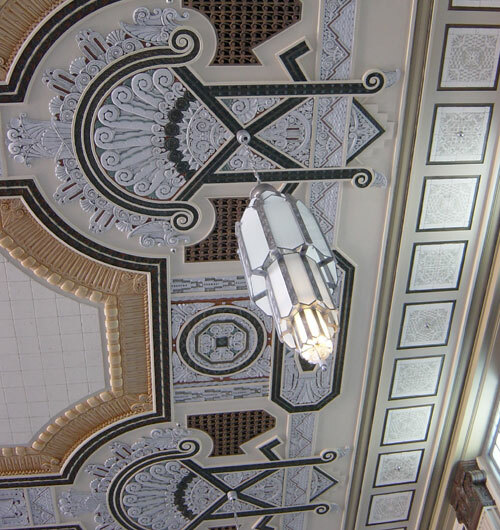 Originally opened in 1931, it is a beautifully restored example of the Zigzag Moderne Art Deco style, and students of architecture come from all over the world to see it. With the exception of the occasional class reunion there, most of our events at the station have been weddings. We were delighted when a client booked the room for a Bar Mitzvah with a New York theme. So with a modest budget and some creative ideas, we set out on a mission to transform T & P into NYC. The south wall of the echoic T & P, sans furniture. The columns have always looked great with colored up-lighting, and this time we used basic blue. 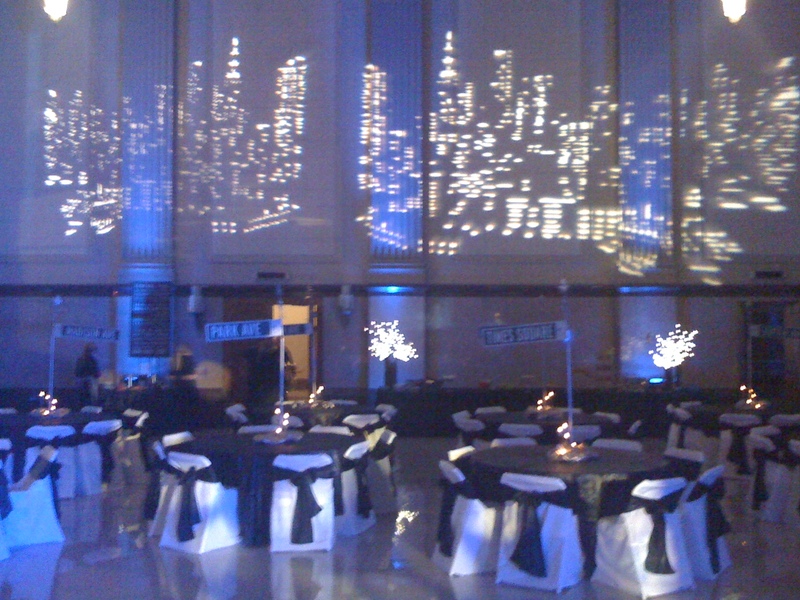 The vast wall was perfect for projecting the New York City skyline. Elsewhere around the room we had large stand-ups of taxi-cabs and skyscrapers, each table had a Manhattan street sign, and food was served from Central Park street vendors’ carts. To set the mood, guests entered on a Red Carpet cordoned off with red velvet ropes on chrome stanchions. While passing through the small lobby airlock, guests would hear a brief looped clip of a classic New York song. 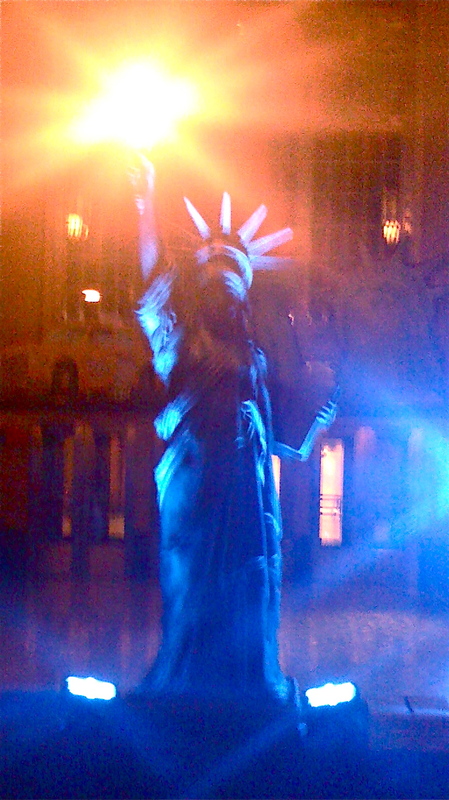 Upon passing through the second door, guests were face to face (or rather face to knee) with the Statue of Liberty, glowing torch and all, and only slightly smaller than the original. People knew they were in for a very special evening right from the start. Any room (or space, it works just as well outdoors) can be transformed for a celebration. Setting the tone for the event with a first impression that takes your breath away makes the rest of it much easier! At Party Machine Celebrations, we have always specialized in events that make memories. Call us with your ideas at 817-294-9539. Way to go Scott! Its a beautiful thing to be creative! I think everyone should have been appreciative for the work you did here. Excellent choice of colors and gobos too! Thank you – thank you very much!